Lala Amarnath had seven children. First there were three daughters, followed by three sons and then another daughter. The boys were named Surinder, Mohinder and Rajinder. In the Patiala tradition all were also given English pet names, Tommy, Jimmy and Johnny respectively. There were just two years between Tommy and Jimmy, and then another six between Jimmy and Johnny. It is not unusual, indeed virtually the norm, for sporting fathers to be desperate for their sons to follow in their footsteps, but that desire burned particularly brightly in Lala. The family lived in Delhi, but fearing that old disputes between himself and the Delhi and District Cricket Association would prejudice their development Lala sent Tommy and Jimmy away to school in Jalandhar, having first smoothed the way for them with the Punjab Cricket Association. With Tommy he also took the unusual step of turning him round as a child, persuading a naturally right handed youngster to become a left handed batsman. The youngest boy, Johnny, was unable to emulate his father and brothers and play Test cricket, but he was good enough to earn contracts to play League cricket in England, and he had a First Class career in India that extended over 16 seasons. That said Johnny never quite broke through, a right handed batsman and occasional medium pacer he never scored a First Class century, although nine fifties and an average of 27 confirm that he was no mug with the bat. He became a journalist, and in 2007 published a fine biography of his father. In 1967 Tommy and Jimmy, 18 and 16 respectively, toured England with a successful Indian Schools side. Tommy in particular made his name on that tour, dramatically hitting the last two deliveries of the game against MCC Schools at Lord’s for six to take his team to victory. The selectors took their first long look at Lala’s boys in 1969/70, when Australia visited India for a full five Test tour. With the series poised at 1-1 Tommy was part of the squad for the fourth Test but, in a match India lost by 10 wickets, he was made twelfth man. Jimmy had been picked to play for North Zone against the tourists, and had scored 68 and taken a couple of wickets. Lala decided it would be a good idea for him to watch the fourth Test, so they travelled to Calcutta together. These were the days when India’s pace bowling resources were woeful, and their seamers only real job was to get the shine off the ball in order to get it ready for whichever three of Bishen Bedi, Erapelli Prasanna, Srinivas Venkataraghavan and Bhagwat Chandrasekhar were in the side. In this series Subrota Guha had had a torrid time. He played in the second, third and fourth Tests but took just three expensive wickets and offered nothing with the bat. Lala sensed a chance for Jimmy and after the game got him into the nets in kit borrowed from Tommy. Jimmy was a decent right arm medium paced bowler of, like Lala, big inswingers. Lala advised him to bend his back and pitch the ball a little short and, with the selectors looking on, proved once again just how well he understood the game. The younger Amarnath did enough to earn a call up alongside Tommy for the final Test. Feelings for Lala must have been mixed as on the morning of the fifth Test. Tommy missed out on a debut, whilst his hunch had propelled Jimmy, still just 19, into the side for his bow in Test cricket something which, at the beginning of the season, he would never have dared dream of. India lost again and the series 3-1, but it was an interesting game. Batting at number eight in the first innings Jimmy contibuted an unbeaten 16 to a disappointing total of 163 after Prasanna and Venkat had done well to restrict Australia to 258. Had he not run out Venkat, much to the latter’s irritation, the lead might well have been rather less, and the drama even greater when Australia slumped to 24-6 in their second innings. Courtesy in large part of some poor catching the Australians escaped from Prasanna’s grip to win by 77 runs. The off spinner’s bowling is rightly lauded, but without Jimmy bowling both Keith Stackpole and Ian Chappell it may well not have happened. Following the series Jimmy’s bowling peaked, and he enjoyed what was to remain his best season with the ball, but neither he nor Tommy were in the party that travelled to the Caribbean in 1970/71, and it was to be more than half a decade before an Amarnath played for India again. Both careers stalled as the 1970s wore on but the 1975/76 domestic season saw a great improvement in Tommy’s returns and with a similar if less spectacular return to form for Jimmy both were selected for the tour of New Zealand that followed. The two brothers did not have the same approach to batting. Jimmy is the better known by a distance, and he had a well deserved reputation as a brave and fearless player of fast bowling, who was never afraid to take the quick men on. But he was also very quick on his feet, more than happy to take a step out of his crease to drive spinners and medium pacers. Tommy was very different, and not just because he was a left hander. He was nimble on his feet as well, but he seldom came out of his crease and his style was not always pleasing to the eye. He moved around with a slight stoop at times, and was a shaky starter with a tendency to nibble at straight deliveries on the off side. He also struggled with confidence when being watched by Lala, his desperation not to fail being counter-productive. For Jimmy there was always the second string to his bow, his useful medium pace which, if never good enough to justify describing him as an all-rounder, was still sufficient to bring him 32 Test wickets and provide a useful option in the days before Kapil Dev arrived to give the Indians a cutting edge. Tommy was no bowler, although he was a fine fielder in the covers at a time when India carried a few passengers in the field, and indeed some would put Jimmy in that category. One idiosyncracy that both brothers had was to play with a red hankerchief poking out of their pockets, a mark of respect to Lala who had done the same. Both brothers were selected for the first New Zealand Test and made substantial contributions to India’s victory. Tommy emulated Lala by scoring a century in his first Test innings, in the course of which he shared in a partnership of 204 with Sunil Gavaskar. He was given three lives by the New Zealanders, so used up his quota of luck. He contributed little to the remaining two Tests in the series, nor the two in the Caribbean for which he was selected a few weeks later. For Jimmy the match was of course in the nature of a comeback, the first of a number he was to have over the years, and he scored a polished 64. There was no century for him against either New Zealand or West Indies but he played in all seven Tests and was a model of consistency. It was in these series that he began to establish his reputation against extreme pace. In New Zealand he had gone after Richard Hadlee and in the great fast bowler’s own words on at least six occasions he hooked me into the stands for six, but there was always a rub, as Hadlee added but the shot brought about his dismissal three times in six Test innings. Moving on to the Caribbean in the bloodbath that was the infamous Kingston Test, when five Indian batsmen were unable to bat due to injury, Jimmy played a lone hand for 60 out of the eventual total of 97. India’s next series was at home against Tony Greig’s England in 1976/77. Contrary to expectations Greig’s men roared into a 3-0 lead. Jimmy batted poorly and bowled without penetration and was discarded for the second time when Tommy came in for the last two Tests. A top score in the first innings of 63 helped India to a consolation win in the fourth Test and with 40 and an unbeaten 63 in the final match it seemed that in the long run it might be Tommy, and not Jimmy who went on to be the more successful brother. A trip to Australia to take on a home nation shorn of its best players by Kerry Packer beckoned and both Amarnaths were in the squad. The series proved to be a competitive one and much fine cricket was played by both sides. For Tommy there was disappointment, injury forcing him home before the Tests began, but for Jimmy, who took his brother’s slot at number three, the series helped him establish himself, even if he would have been disappointed at India losing the deciding Test. There were innings of 90 and 100 at Perth that particularly caught the eye. Also memorable was Jeff Thomson poleaxing Jimmy and knocking him out cold. And the more so the way Jimmy got up, dusted himself down and after a brief retirement carried on as if nothing had happened. After 18 years in which the two countries had not met at all India toured Pakistan for a historic three Test series in October and November 1978. The cricket was, from an Indian perspective, uninspiring as they lost 2-0. Both Jimmy and Tommy played in all three Tests, and whilst neither made much impression Tommy did rather better than Jimmy, but it was he who lost his place, never to regain it. He was 29 and in ten Tests had scored 550 runs at 30.55. In the second Test a helmetless Jimmy had ducked into an Imran Khan bouncer and had to retire hurt. Imran wrote later that he came back and played reasonably well in the second innings and that in the next Test he played some incredible shots, and showed no ill-effects from the blow on the head. Shortly after returning from Pakistan India had a six Test series against West Indies. Jimmy had another disappointing match in the first Test and lost his place again, although he was back for the last Test when a century, albeit a rather uninspiring one, made sure of his place in the party that toured England in the summer of 1979, playing four Tests after the second World Cup. The Indians had an immensely disappointing World Cup, and Jimmy never got going. In the Tests he played in the first and third and achieved little. Then on a green Trent Bridge wicket he showed his usual guts and determination against Richard Hadlee and Clive Rice, hooking both before closing the day’s play on 59 not out. Next morning, before he had added to his overnight total, Hadlee hit him on the temple with a bouncer as he essayed another hook. The injury caused Jimmy to fall on his wicket and, more worryingly, fractured his skull. It was a relief to all that he made a full recovery, Hadlee’s final verdict on him being He always accepts the challenge. I don’t think I have ever seen him duck a bouncer, or sway out of the way. The following home season was a historic one for India as they took a series from Australia for the first time, winning a six Test series 2-0. Jimmy was fit again by the time that the final Test was played, and that was his first game back since his contretemps with Hadlee’s bouncer. India won by an innings, but Jimmy failed, and it seemed like his career had probably gone the same way as Tommy’s. He was lbw to Rodney Hogg for just two and, remarkably given the reputation that he left the game with, his ability to deal with fast bowling was openly criticised. It can only have been a tendency to rash shot-making. Jimmy’s courage could never be questioned. It was to be three years before Jimmy, by sheer weight of runs, forced his way back into the Indian Test side and he had a remarkably successful return. First of all was a six Test series in Pakistan. The home side won 3-0, and Imran was irresistible, taking 40 wickets at just 13.95. With a new two-eyed stance and a helmet Jimmy, who took three centuries from the Pakistani bowlers and ended the series with 584 runs at 73.00, was the only Indian batsman to look secure against Imran. The Indians did not have long after leaving the Caribbean before arriving in England for the 1983 World Cup. After their dire performances in 1975 and 1979, coupled with their poor form, no one expected them to do anything other than make up the numbers. In the event of course they produced one of the great upsets by beating England in the semi-final and, despite totalling a modest 183 in the final, they ran out victorious over the all-conquering West Indians by 43 runs. Jimmy was man of the match in both games, as much for his economy with the ball and the wickets he took as the runs he scored. Perhaps Jimmy became over-confident as a result of these successes, but whatever the cause he had in 1983/84 what is surely the most chastening experience that any major batsman has ever had. India’s season began with a three Test home series against Pakistan. In a manner reminiscent of the early series between the two nations all the Tests were left drawn. Jimmy batted once in each of the first two Tests, scoring 4 and 7, before falling ill on the eve of the third Test and having to withdraw. Eleven runs in two innings is not good, but it amounted to comparitive riches in the light of what was to come when the West Indies arrived in India. Jimmy was retained for the first two Tests but, unsurprisingly scores of 0, 0, 1 and 0 cost him his place. He was given another chance in the fifth, but two more noughts brought an end his misery. At 34 it seemed from a distance that Jimmy’s reactions had probably dulled a little, and that his international career was over. But those of us who felt sympathy for a fine player going out on such a desperate low had reckoned without the Amarnath determination. With a stance remodelled once again, this time on more orthodox lines, the selectors decided he was the man for them in a two Test series in Pakistan that was scheduled for October 1984. Jimmy’s unbeaten 101 in the follow on saved India from defeat in the first Test. Unsurprisingly he was then picked for all five Tests that followed against England, and an average of 58.14 was ample confirmation that he was as good as ever. The next season was reminiscent of Jimmy’s greatest days as he averaged more than 70 over two Tests in Sri Lanka and three in Australia before he arrived in England for the second time. He missed the second Test through injury but contributed a half century to each of the other two Tests as England slumped to a 2-0 defeat and might well, with another hour’s play in the final Test have been beaten in all three Tests. By the start of the next season Jimmy was 36 and India had a busy season with eleven Tests. Jimmy played in all bar one, and there was a century in an innings victory over Sri Lanka, but overall Jimmy wasn’t as flent as in the past, and he was omitted from the squad for the 1987 World Cup, which he might have accepted more readily had he even been considered. India weren’t finished with him however, and he came back again after the first Test against the visiting West Indies in 1987/88. He didn’t achieve very much in the Tests but showed some form in the ODIs, including becoming only the second Indian batsman to score a century against West Indies in that format. In October of 1988 Jimmy played, not without some success, in the Asia and Sharjah Cups but he was then left out of the side for the first Test against New Zealand. He wasn’t happy and described the selectors as a bunch of jokers. At the subsequent disciplinary hearing he walked out after being refused representation by Counsel, and was fined around GBP800 in his absence. He refused to pay and the consequent stand off meant that he was not recalled against New Zealand, and although he was with the Indians on their tour to West Indies that followed that was as a commentator. This time, predictably in light of his age, there was no comeback to the Test side, but the great survivor did retire on his own terms, as he was recalled to the ODI side in October 1989 for the Champions Trophy in Sharjah and the Nehru Cup at home in India. 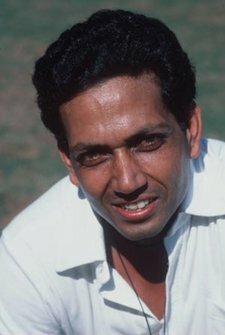 With the bat Jimmy Amarnath averaged 42.50 over 69 Test matches, the mark of the very good rather than the great, but perhaps he was a rather better player than that figure suggests. Certainly his old adversary Imran has said of him I have rarely seen such a classy batsman, which is praise indeed coming from a man who consistently dominated India with the ball during Jimmy’s time. But Imran’s most telling comment about Jimmy was Had I been his captain I would never have dispensed with him – he’s a player on whom you can depend when the going gets tough. Please get your facts right about Surinder Amarnath\’s batting .. He was without doubt one of the greatest Lefthanders ever produced by India. Mohinder was great but Surinder was better . Questioning his ability describes your bookish knowledge of cricket. A consequence of Amarnath\’s batting in 1982-3 and 1983-4 was that he his batting average was 30.44 at home, 51.86 away; the biggest difference (that way round) for any batsman scoring 2000+ runs.